Today begins 30 days of photos from around here... give you a little taste of life here. Im sure some will be fun, some will be of ministry things, and some will be just random neighborhood things I find interesting! Lots going on around here the last few days! we started off our community center stuff this week-- english, knitting, basketball,guitar and drum classes are in full swing! Today also started our Crepe selling buisness. 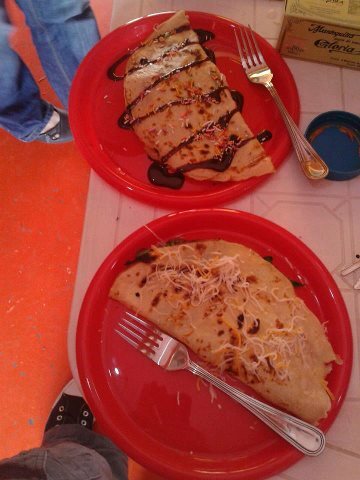 Every Thursday from 12-3 we are selling crepes out of our locales. 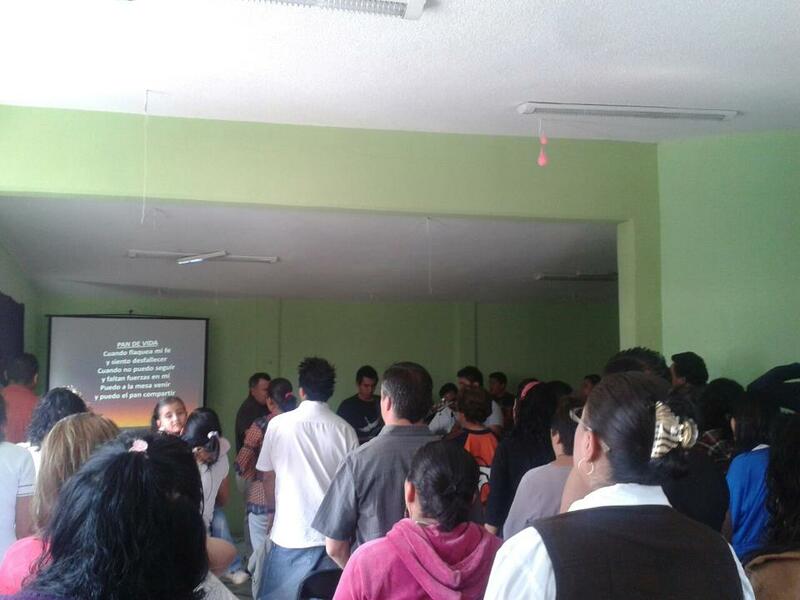 2. its the first effort to make the community center/ coffee shop self sustaining and able to pay someone a little to keep it going when us gringos go on to the next church plant! Today our crepe buisness did better then I anticipated for the first week--- we at least covered cost of the supplies! I never knew how hard it was to find a good bible study for teen girls... well, its even harder to find one in spanish, that we liked! 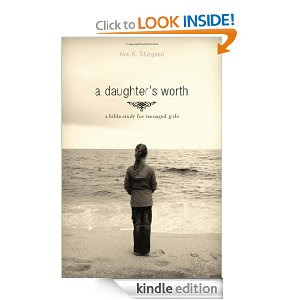 But next week we are going to start "A Daughters Worth". We were doing a different one, but stopped because we found it was too much for them. I am curious to know--- how long will it take before I don't have expectations anymore. Let me explain in a story. Last week when we were in Honduras, we got the opportunity to go on a little excursion for the day! Leaving mainland to go to the islands to hang out at the "prettier beaches". We take a little boat to the first island. Beautiuful... but not the typical beach... and really no place to hang out. But it was just a stop on our little tour! We go to the second beach. Also very beautiful.... and where we will be spending the rest of the day. It is one of those rare treasures you come across, it was a beach basically not touched ... the way God designed it! And behind the beach was a jungle. So pretty! Our guide askes us if we want to go see the famous boa. He had told us about it. It is only found on one island. He said it is a five min walk. Of course we say YES-- who wouldn't want to see a famous caged boa! I am paying attention to smacking the bugs off me when i run into the back of Tiffany. Then i realize what just happened. Tiffany asked our guide where this snake was/.... His repsonse "I am searching for it"
She froze. I ran into her! Americans -- thinking everything is in a neat little cage! We found those big ol nasty boas hanging out and blending into the trees. In fact we saw about 10 of them! He kept saying they were calm because they didn't bite... my logic says "no but they WILL strangle you to death--- slow and painful"
I am not sure when I will figure out that my expectations don't always line up with everyone elses! Anyways, I went boa hunting have you? Tiffany and I had a great time in Honduras last week! The first part of the week we were able to see lots of different ministries (coffee fields, new churchs, orphanages and schools) happening there and what God is doing! The second part of the week we had some fun with one of the Camino Honduras teams at the beach! This week kicks off our Community Center Fall activities! Here is the flyer! Please be praying for us as we get ready for everything, for new people to come, for relationships to become stronger, for learning, and sharing! Today is Mexican Indep. Day! Similar to our fourth of July celebrations---- there are lots of partys! The first with our church! Lots of food, lots of games, and lots of fun just hanging out with people! :* lots more pics on facebook!!! Nothing is easy--- everything is comical! Here is a story.... we need a car, like seriously! After heading to the gym today, with a list and giant reusable bags, we headed for the big market in Ixtapaluca. We are getting ready for tomorrows festivities (Independence Day in Mexico)... We needed LOTS of kilos of veggies (for tinga and salsa), 50 ears of corn (feed corn not sweet unfortunately), 3 more (special ordered) pinatas, candy to fill them, cheese, etc. We thought it would be heavy but do you know how much 50 ears of corn weigh? ugh! Well actually 48... they come in groups of 24 and they didnt know how to charge us for 2 extra! haha. After finishing with the veggies... we begin carrying the million pounds of stuff we now have.... and bag number one breaks...and bag number two starts to rip. We still have to go to the pinata place! Tiffany is now laughing (uncontrolably) becuase she is convinced she looks like a pregnant penguin while carrying her bag--- and i would have to agree! So, we put this stuff outside and i sit with it while Tiffany goes and gets the rest of the stuff. At this point we have no idea how we are getting home... combi? ya right! Taxi... will it all fit? yikes! Fortunately (well kinda)... we were only able to get the candy today because our nice pinatas got destroyed in the giant storm we had last night! So, we get to take another trip back to get the pinatas in the morning! Don't worry they saw us coming and quickly opened the trunk for us (all while holding back thier chuckles!!). We are back and ready to husk all that corn now! Nothing is easy but everything is comical! But, a car would be nice--- maybe one day! Jim made a video of (most) of the bible studies that happen on tuesday nights. Only thing missing is our youth girls bible study, which typically happens at my house during the same time! So, go check it out! And Rods had some fun ones recently too. Check that out too! Pray we are able to find a permanent place for our church! Here I am send me! Here I am, Send me! Send me? Like where? Like anywhere? I knew it was a risky prayer, but it resonated in my heart. So, I stopped praying for everything i thought I needed in my life and started praying God would use my life in whatever way He needed to. The He would send me somewhere.... or keep me at the job i loved. And I meant it! I did pray that prayer alot... and my life had changed alot. I went on a missions trip to Mexico. Knew I was suppose to live in Mexico... and finally put in my application. I remember sitting in AWE after I finally committed... wondering what the heck i just did. Because it was Mexico. It was far away from everyone i loved... different then anything I have ever known. Then I remember what I told God. I still meant it. I never asked God to make my life easy, or totally safe... although i have been tempted! I told him to send me where ever He needed me. What I didn't think when I asked God to send me... was that He was going to take me completely out of my comfort zone... and leave me there. This place has been a mash up of SO many things for me.... opportunity, desperation, fear, hope... a place where I have really had to depend on God--- more then I have EVER before (have you ever had to learn a new language and a new culure?). A place of brokeness. A place of restoration (in a lot of different ways). Mexico is home now. Mexico is where my heart is. Mexico is amazing, fun, new. I would never change the last 13 months for anything. I know i have even more experiences here to come, I know God is going to not only use this place to change me but use me in this place as well. I can't wait! We will be kicking off a "be born again" outreach in our neighborhood soon! It will all come together for a big party at the end of the community center activities in December. Please be praying for this! One of the components will be the banner below. 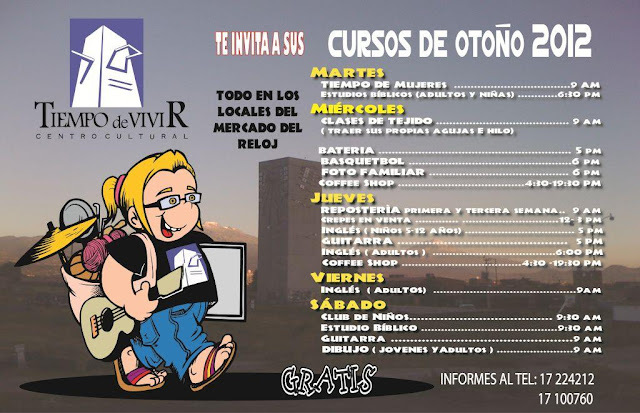 Do you want to change mexico? Yesterday we went to our FIRST Mexico Soccer game!! Mexico vs. Costa Rica! Check THAT off the "Mexico Bucket List"
1. At home we taunt the other team... especially when they are about to kick (or whatever).... In unison the ENTIRE stadium, when the other teams goalie kicks the ball, screams and then yells not so nice things.... EVERY SINGLE TIME! 3. Instead of nachos and popcorn... they sell ramen noodles and cups of fruit! But, yes, everything was still rediculously priced! 4. The line at the bathroom durning half time.. SUPER SHORT!!!!! 5. Just like where ever you go--- as you go in, unless accompanied by a body gaurd (fabian) everyone will want you to buy something from them! 7. They dont really LEAVE the field at half time... they blow up this inflatable thing and everyone gets inside! 8. AND when Mexico scores a goal--- Everyone throws thier beer. Which means you get beer on you! IT was a great time and I hope we get to go to more games! Compare yourself to the Joneses? Who doesn't? Here is a website I came across where you stand in comparison to the rest of the world! I put my salary in and I am richer than 78% of the world. Kinda crazy huh? I think sometimes we forget that even though we can't afford the new latest gadgets, or the best new clothes, or be able to do this or that .... that we are way better off then we think! I have a roof over my head, I have food in my fridge, I have hot water in my shower, I have enough to give to others, I even have internet in my house!! Why do i feel bad for myself when I can't by something that will be outdated in two years! By American Societies standards.... I don't make much money. FAR from it! But, I live a blessed life and fairly simple life--- and I LOVE it! I am richer than 78% of the world... I wondered how much one could make and still be richer than HALF of the world (according to this website!) $2,940 a year. So you don't have to do the math ... that is $245 a MONTH! And if you ONLY make TWO dollars a day you are STILL richer than 10% of the world! Go live like your as blessed as you are! Almost every friday night we have some sort of activity with the youth. It was just a movie every week. But, we recently changed it. One week we are watching a movie... one week playing some sort of games (WII, UNO, board games etc), One week we have nothing, and one week we debate some sort of topic. Last night was debate night. We debated Dinos! With the youth split into two teams... one debating with the bible and one debating with science. The kids did a great job... had fun... and learned even mroe of God's word in the process. Our debate next month (becuase it came out with some of the youth...) Is God real? Today the youth helped us clean and get the community center ready for classes coming up AND the Independence day party next saturday!